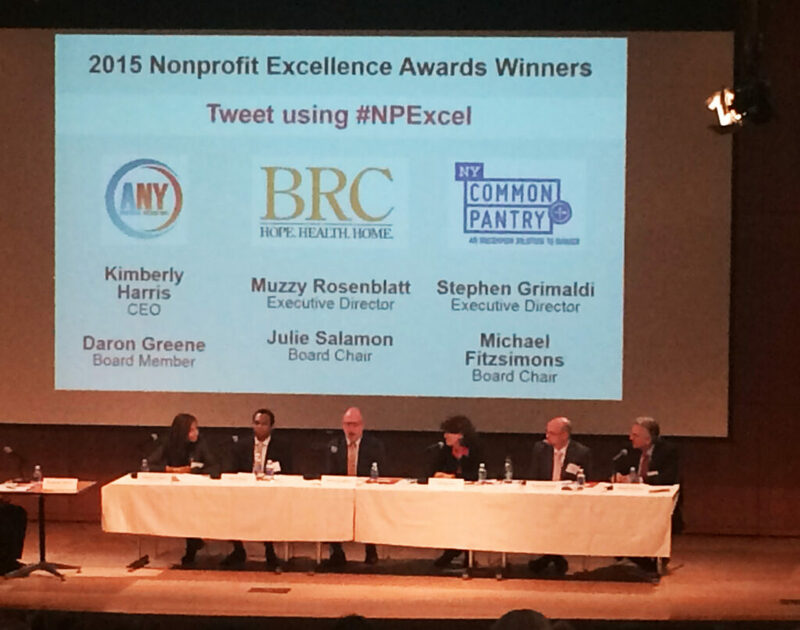 Congratulations to all the winners of New York Community Trust’s 2015 Nonprofit Excellence Awards which recognized outstanding management practices among New York’s diverse nonprofit community. Below is the press release which includes details on the event and all the 2015 honorees. NYCP is dedicated to reducing hunger throughout New York City while promoting dignity and self-sufficiency. ANY fights for economic mobility for ambitious, first generation college students by providing transformative mentorship and intensive career development. Helping people reclaim lives lost: BRC restores hope and dignity by offering opportunities for health and self-sufficiency. The three organizations were honored for their excellence at a November 18th Awards presentation at which the Gold, Silver and Bronze Prize winners were announced. The Awards followed a special best practices workshop where the winners engaged in a panel discussion about the management practices that led to their selection. Winners were selected by a distinguished Selection Committee of 34 nonprofit experts. The Gold Prize winner received $30,000. The Silver Prize winner received $20,000, and the Bronze Winner, $10,000. All winning organizations also received tuition scholarships for the Columbia Business School Executive Education Programs in Social Enterprise. Award winners were selected based on their excellence in eight key areas of nonprofit management: focus on results; governance structure; financial management; human resources; diversity and cultural competency; IT practices; communications; and fundraising. Click here to read a copy of the press release.